Click the link to watch a promo clip of John Robertson's The Dark Room. 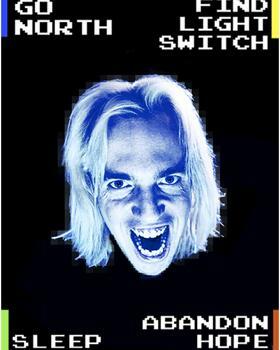 THE DARK ROOM is the world’s only LIVE-ACTION VIDEOGAME! After 4,000,000 YouTube hits and sell out shows in London, Berlin, Sydney, Hong Kong, Edinburgh and Cambodia, THE DARK ROOM comes back to Brisbane for the first time since 2012! Get ready for an interactive comedy that fuses retro videogames with terrible prizes and a comedian dressed head-to-toe in leather and spikes. Sound weird? It is! But let’s be fair, so are you. Get in here. It’s a choose-your-own-adventure, so choose it! Oh - and there’s a grand prize! If anyone wins, they get £1000, which I’m pretty sure can buy you... all of Toowoomba? IF ANYONE WINS, THEY GET ALL OF TOOWOOMBA.